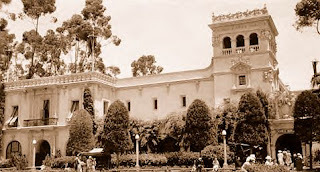 The California-Pacific International Exposition's Café of the World was located at the north-east corner of the Plaza del Pacifico and the Avenida de Palacios, and was known as the Home Economy / Pan-Pacific Building during the 1915-16 exposition. 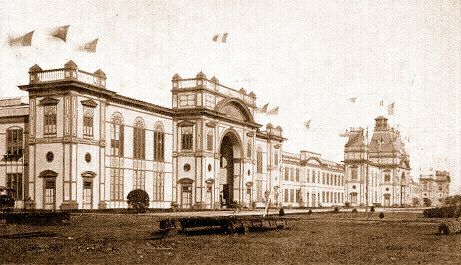 The interior, which had a total seating capacity of 1,250 persons, contained a restaurant with a large main dining room, two 70-foot long oval-shaped cocktail bars, and a corner coffee shop. 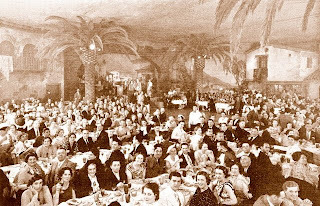 The restaurant's dining room, seating 850 guests, was designed to represent an open-air Spanish courtyard, and featured a simulated sky overhead and support-columns disguised as palm trees. The deluxe restaurant featured international cuisine from various countries of the world, in addition to continuous cabaret entertainment and a large dance-floor. The two cocktail bars were presided over by twenty "international" bartenders, who served mixed drinks priced at 35-cents each; while the coffee shop served simple meals, and was open from 7 a.m. to 1 a.m. daily.